Rattlesnakes are some of the most amazing snakes. They have a rattle on their tail that they shake to warn predators that are getting too close. The Western Diamondback is the biggest snake found in the United States, and they are found on other parts of the earth as well. We hope you enjoy these rattlesnake fun facts! Rattlesnakes belong to the group of snakes called pit vipers. All pit vipers are very good hunters and use venom to kill their prey (the animals they eat). 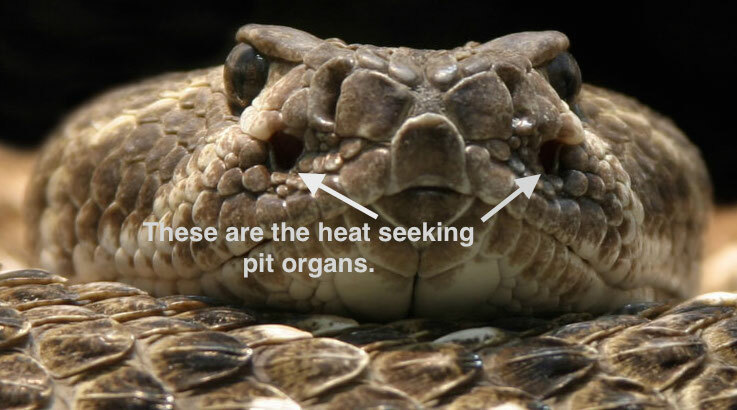 Pit vipers are distinguished by the presence of a heat-sensing pit organ located between the eye and the nostril on either side of the head. They can actually see your body heat! 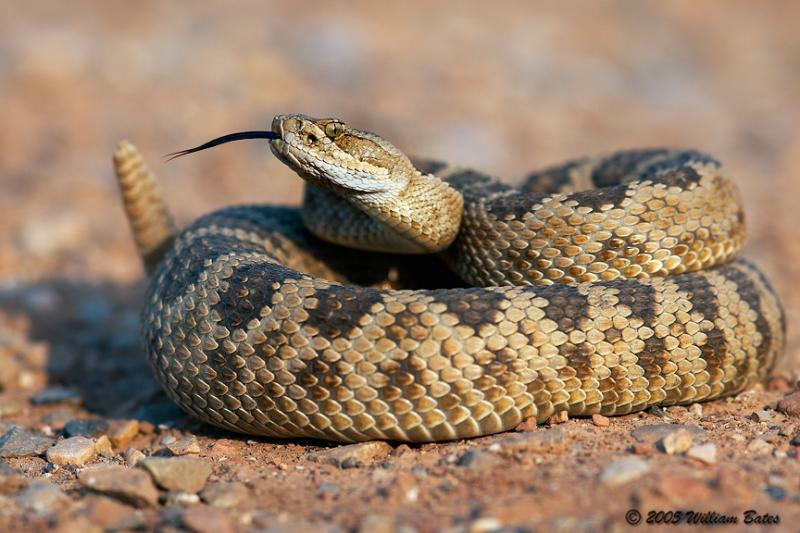 When a rattlesnake shakes it’s rattle it is saying, “STAY AWAY!” The shaking rattle means it is either angry, scared, or both. So what makes the rattle… rattle? The rattlesnakes rattle is made of the same stuff our hair and fingernails are made of, the material is called keratin. Keratin is added to the thick pieces of skin, called buttons, on the snakes tail. When the snake shakes them, they hit each other and make the rattle noise. Click play on the video below to hear the rattle noise! Have you ever had to get a shot from the Doctor? It’s not very fun is it? Well that is exactly how the snake’s fangs work. Each of the snake’s cheeks has a sack full of venom that is squirted through the fangs. When they bite their prey, venom is injected through the snakes hollow teeth. 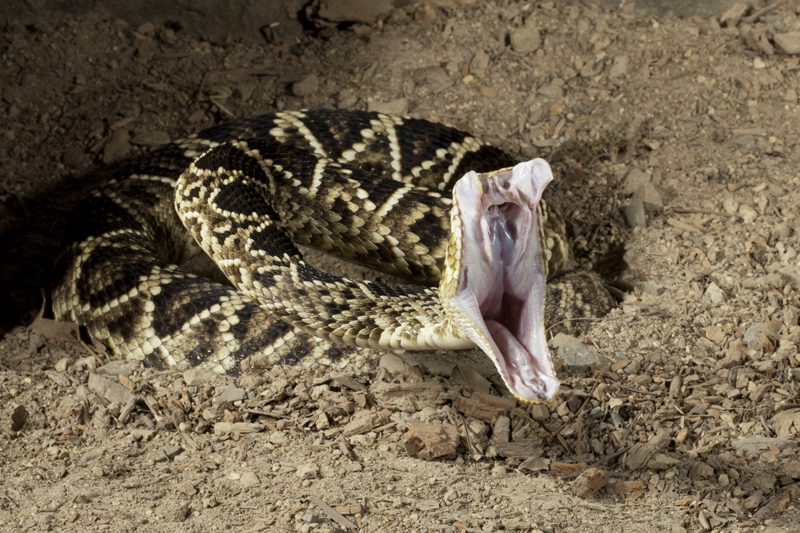 The rattlesnake can also open it’s mouth VERY wide, look at the picture below, do you see the fangs? Here are some other quick rattlesnake fun facts! We hope you enjoyed these rattlesnake fun facts!